New: The 2010 eclipse at Hao in French Polynesia. On what has to be my most remarkable eclipse trip to date, we saw the great total eclipse of July 22 2009 on the Enewetak Atoll in the Marshall Islands. Enewetak was the site of many nuclear bomb tests, including the first hydrogen bomb. Today it has been cleaned up and is re-populated, but the presence of a long airstrip allowed us to fly there and experience the eclipse on the centerline in the place with the best weather forecast along the path. Totality was 5 minutes and 40 seconds, though we missed the first 30 seconds or so due to a stray cloud. While it is super-solar-minimum right now (no sunspots) the corona was quite compact and there were only two visible prominences, neither very apparent to the naked eye. (Compare with 1999.) 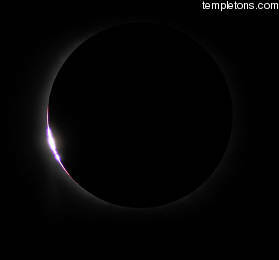 However there was lots of good structure and like all total eclipses it was a wonderful drama. Almost as dramatic was the story of getting there, which you will find after the pictures. 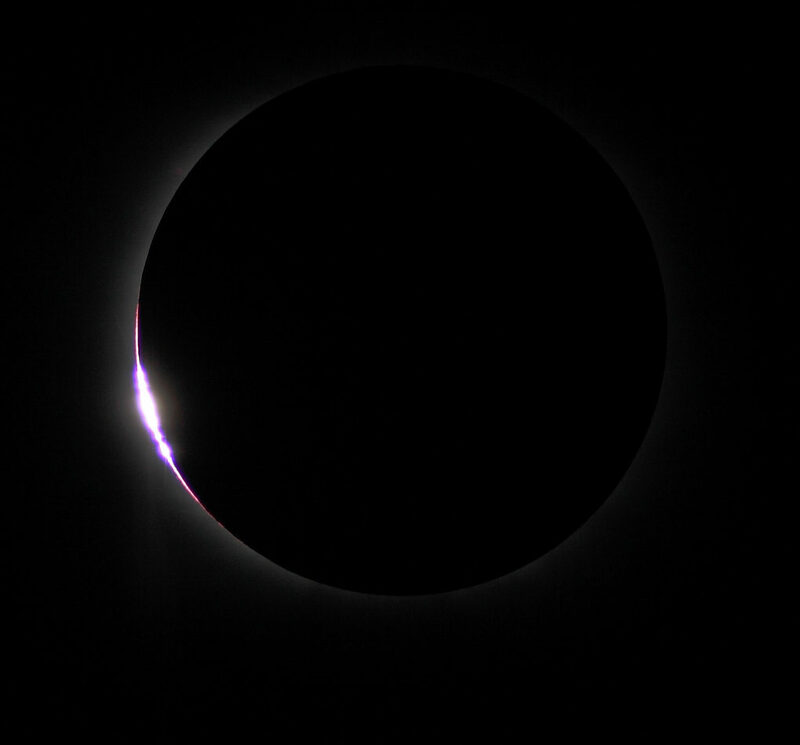 I got far better pictures than I did during my 1999 eclipse cruise and these are just the first shots from one camera. Track the Photography section of my blog for updates. Chromosphere begins to emerge from the limb of the moon at 3rd contact. Note prominence in upper left. There were not many. A long duration shot shows the surface of the moon lit by earthshine. Not normally visible to the naked eye unless you take special steps. In spite of the clouds, the camera captured the diamond ring of 2nd contact. A shot by K. of the sea with sunset all around, and the eclipsed sun and Venus well below it. The airstrip at Enewetak. Not maintained for a few years but still works. Two nuclear craters. One was filled with other waste from Bikini and covered over. You see the big blue hole in the atoll? There used to be an island there. Mike, the first H-bomb, destroyed it. This shot shows me briefly experimenting with doing a panorama. (It's too dark to do a handheld so I aborted) with the eclipsed sun and Mercury above me. This was my 4th eclipse. They are addictive. A few years ago, I related how wonderful they are to a friend who, thanks to a very successful dot-com IPO, has access to a long-range business jet. Travel to an eclipse through such a jet has many great advantages. 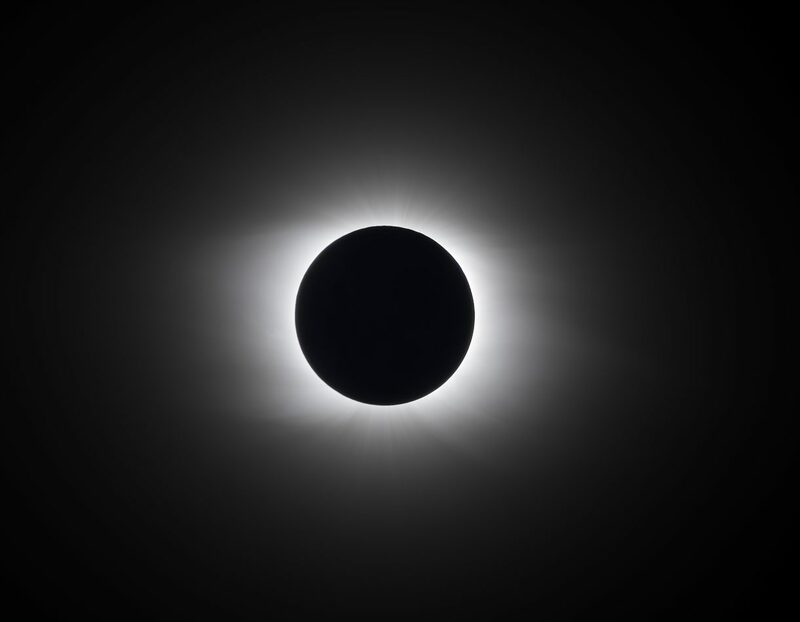 You can get places that are otherwise not accessible, you can change your plans at the last minute to seek a location with clear skies, and if all else fails and there are no clear skies, you can take off again and observe the eclipse from the air. We ended up on Enewetak, the northwest most atoll in the Marshall Islands. The runway there was first built by the Japanese in WWII and enhanced when the U.S. performed nuclear tests around the atoll in the 40s and 50s. Of late, it has not been maintained, and aside from an emergency landing by a Continental flight, it has not been used by jets. It is long enough at 7600 feet, and it was some years ago an potential emergency landing strip for the space shuttle. During preparation, I had researched several locations to view the eclipse. In spite of this being the longest eclipse of the 21st century, with lots of landfall, prospects were poor. The land section began in India then moved into China, passing over the heavily populated Yangtze valley and Shanghai. After passing a few Japanese islands, including the former Iwo Jima, it would hit only a few small islands in the Pacific. China and India are easy to reach, but it's monsoon season, and the chances of clear skies were poor on the entire path. Plus, even when the sky is clear in places like Chongqing, Wuhan and Shanghai there is usually thick smog. I researched the various islands. Average cloudiness was high for all of them too. Only a few Japanese islands were close enough to the centerline to get a long eclipse, but access to them was highly restricted, especially Iwo Jima. (Many tours which thought they had access eventually had to cancel.) I scoured through the others and found that only Enewetak had a long enough airstrip for a long-range jet. The others could be reached only by boat or shorter-range aircraft after flying to one of the bigger airports just outside the eclipse path. Initially, we made plans to just fly to China on commercial airlines. The advantages of a private jet don't apply to China -- Shanghai is easy to get to, and the Chinese don't tolerate random changes of flight plan or even a flight plan that just wants to see the eclipse from the air. In addition, flying over the ocean from Shanghai would put the sun up 70 degrees or more in the sky, hard to see from a plane's window. As the eclipse approached, many people worked on weather forecasts to help eclipse chasers. The forecasts for China were poor, and got worse. With a few days to go, it looked like nobody in China or Japan would have a good chance, the sort of chance worth such a long trip. However, a hole in the clouds was forecast for Enewetak. What we didn't know was whether it was safe to land. It was hard to get information -- and it was by then the weekend there. Air Marshall Islands, a cash-strapped airline, flies a Dash-8 turboprop plane to Enewetak sometimes, but the Dash-8 can take-off in 2,600 feet and does so much more slowly, designed as it is to handle rougher airstrips. One report suggested that inhabitants had started camping on the airstrip, but that if you did a low pass over it, they would realize it was a very good idea to clear off of it to let you land. We got more and more weather models and it was clear Enewetak was the only place with a high probability. Sunday afternoon, the pilot was still very wary of the airport and it seemed like we would not go. At the last minute new information came in which increased the landing to "probably," and so, on Sunday evening, it was decided to do it, departing Monday at 1pm. This followed a rush of packing, preparing equipment and picking up a rental telescope. I had encouraged the plane owner to consider taking along Landon Noll, an astronomer friend of mine who has built special equipment to search for possible asteroids inside the orbit of Mercury -- such asteroids could only be seen during an eclipse, if they exist. This added some genuine scientific merit to the mission. Landon had to load together his gear in just 4 hours, but it was already mostly packed. We flew to Majuro, the capital of the Marshall Islands, which has a "real" airport. 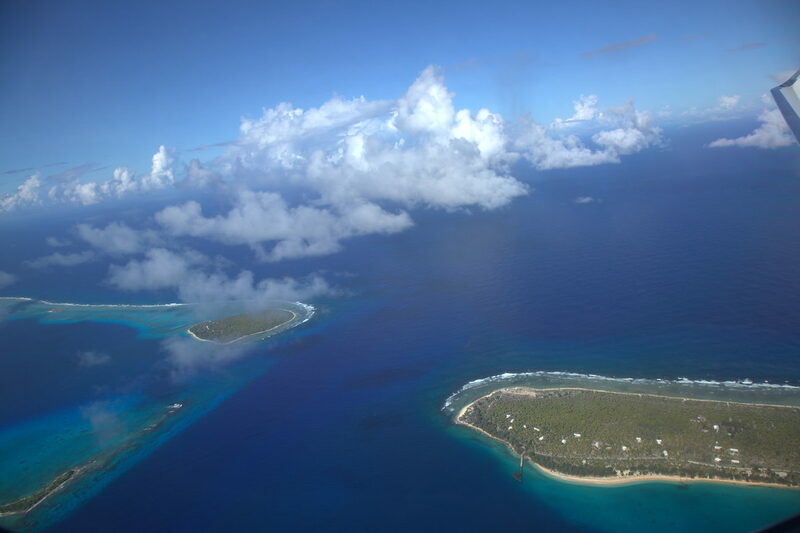 There, we would be able to track more weather, charge batteries and talk to the pilots from Air Marshall Islands. This is about a 10 hour flight from the bay area. 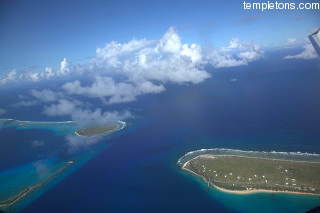 Majuro is also an atoll, of which I saw very little due to the last minute nature of the trip. A report came back on the airstrip saying it was in decent shape, though a bit soft (gravel) in places. The last 250' was not usable but we did not need that. As a backup plan, we had checked into chartering the Dash-8. No surprise, it had already been chartered by a Japanese eclipse tour, to fly to another, closer island named Jaluit. Jaluit would get a modestly shorter eclipse and was a good choice for this group when they planned things a year ago. However, the weather report said rain for Jaluit and clear skies for Enewetak. We asked the tour group if they would like to consider Enewetak and take us if we could not land there ourselves. While this would be an obvious "yes" in my mind, they had not planned for this, and some of their passengers had to return to Majuro quickly for their return to Japan. Sadly, their path was fixed, and I fear they flew to a rainy island, but I hope they got a break in the clouds. The Dash-8 has flown a crew of astronomers from Hawai`i and elsewhere to the island a few days earlier, needing a stop to do it. In Majuro I also did the very nerdy thing of downloading perl to my laptop so I could write code to generate photographing scripts for the cameras. We flew to Enewetak and did our first low pass to inspect the runway. There was nobody on it (they had heard we were coming by satphone) and it looked decent. We did a tour around the atoll to do another pass, then decided we were "go" to land. The skies were clear. We put on shoulder belts just to be safe, but got a smooth and perfect landing, then taxied to some concrete pads on the end of the runway which would solidly hold the plane. Folks were out to watch us land, but after landing we were met by one local leader and, it seemed, the whole police force of the island, curious and willing to help. Women came out to give us leis and some guys brought a cooler with fresh chilled coconuts which they whacked open with machetes. Yum. Locals from the island helped move our equipment in their trucks and set up a tent and table for us. It seems the police may have kept the other locals timid as they did not visit us. I went out and handed candy bars to some of the children who were off in the distance with their parents. They were very shy and didn't know what to think, though they liked the candy. It was off to set up the equipment. We had lots of nice DSLR cameras, and I had bought software which would control them all to shoot timed photos while we watched the eclipse. 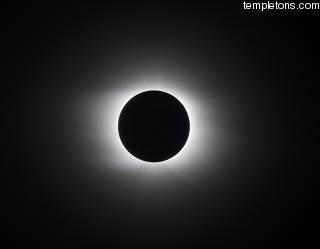 (As great as it is to photograph an eclipse, it should be watched.) Due to the late planning, I had just bought the software a few days before and done some basic tests. I planned to write the shooting scripts on the 10 hour flight but of course there were other distractions of private air travel with friends. In addition, the software is not very easy to use -- I don't expect a lot since the market for such software is of course very small -- so I only got it to control two cameras and only really had it working just a few minutes before the eclipse. Indeed, it was somewhat like a movie moment, where the computer programmer is given some task and completes it just moments before deadline. There is no deadline like an eclipse. You can see it approaching in the sky, the moon and sun sliding inexorably along one another, and it will happen whether you are ready or not. Things were also made worse as I got a bit overheated since I had to do all the telescope setup out of the shade, and I was not very familiar with the rental scope. This is always the way with eclipses though. I know (and the software boldly reminds you) that you need to plan well in advance and do many test runs, but things never go as planned. In spite of our positive forecast, cloud density increased near the start of totality. This is probably because as the sun gets blocked, the air cools and more water condenses. Just as totality was about to start, a seemingly large cloud moved in front of the sun. We missed 2nd contact, which is one of the best parts, and I cried out "no, no..." with all our planning seemingly going to waste. 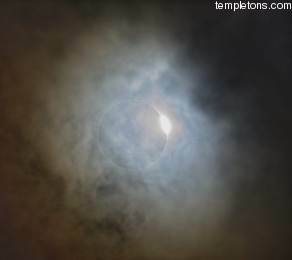 But the cloud moved quickly and was gone in 30 seconds, and the rest of the eclipse was clear. We all cheered as the eclipsed sun appeared and enjoyed the eclipse and the beautiful tropical setting with a 360 degree sunset. The cameras clicked away with minimal checking needed and got some good photos. I managed to watch a fair bit of the eclipse with my eyes and binoculars though I didn't get down to lie on the beach as planned. 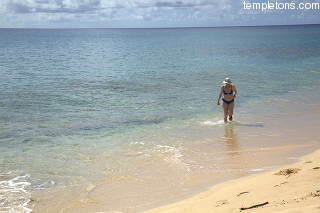 We took a quick swim in the sea and had to pack right away. We had deliberately landed with only a partial tank of fuel, to keep our weight low for takeoff in case the runway's usable length was not sufficient. In order to meet flight windows at airports, the pilots were insisting we take off again fairly quickly. I was sad to not get a real chance to see Enewetak and meet more of the people. I also was sad that we didn't get a chance to go meet the other eclipse teams that had reportedly come to the island -- one on an expensive scuba yacht tour, and one astronomer group who had chartered the Dash 8 some days before. Private air travel is, as you might imagine, extremely pleasant compared to commercial, just as your car is much better than the bus, and it's hard not to feel a bit extravagant while doing it. However, this sort of trip -- to an otherwise unreachable location with the ability to change plans "on the fly," bringing along many heavy scientific instruments, seems precisely what this sort of aircraft is best at -- a real trip-of-a-lifetime experience. 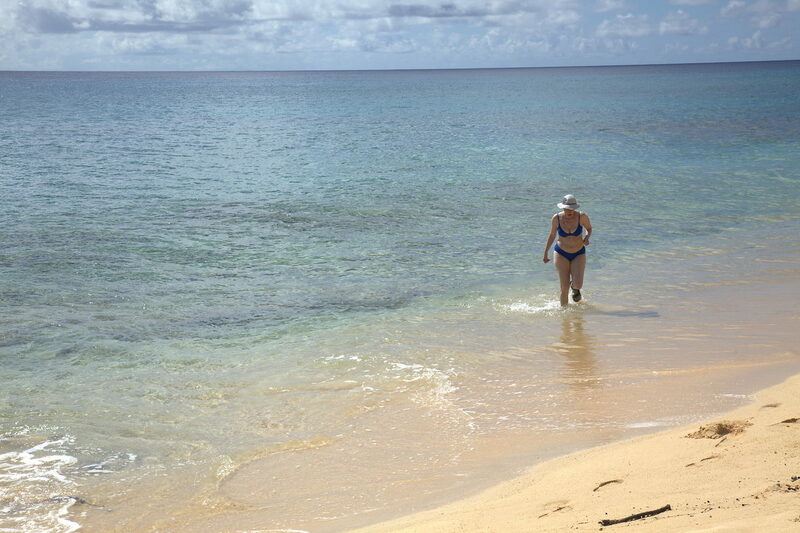 the Hawai`i Year of Astronomy blog has some great stories of the other visitors. The Marshall Islands Journal thinks we're NASA scientists. Satellite photos looking down at the moon's shadow over Enewetak. Crater where Elugelab island was on Google Maps. Article on the explosion of Mike from a documentary on the H-bomb. a blog post linking scores of eclipse reports. Comments on this article can be left on the blog page. 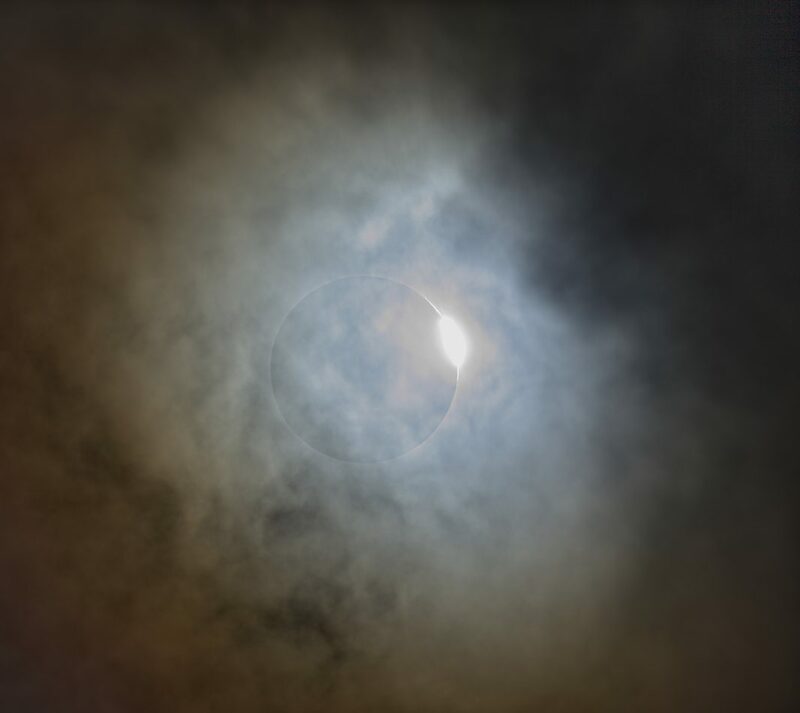 Eclipse images with Brandon 680mm f/7.1 refractor and Eos 5D Mark II Camera, with clock drive. Other images coming soon from Canon 600mm f/4 on 1Ds Mark III and Canon 300mm DO on 5D Mark II. Daytime images from 5D Mark II with 28-115 f/4L and Powershot 870IS.